Description: Detailed large political map of Oklahoma showing cities, towns, county formations, roads highway, US highways and State routes. Oklahoma is a state that is situated on the south central part of the U.S.A. In the 2007 census, it was found that there are about 3,617,316 people living in this state. Oklahoma has a land area of about 177,847 square kilometers and it is considered to be the 20th largest state in the country. 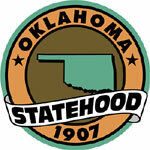 The Sooner State is a nickname that some people use to refer to this state. Oklahoma City is the largest city as well as the capital city of this state. Oklahoma is the only state in the United States that has the same name as its capital city. Oklahoma is the chief producer of oil, agriculture and natural gas. The state also depends on biotechnology, telecommunications, energy and aviation. Of the many states in the country, Oklahoma is considered to have an extremely fast developing economy. It’s GDP and income is considered to be one of the top among the states in United States. Of all the largest cities in the United States, two of these cities are found in Oklahoma and they are Tulsa and Oklahoma City. Tulsa is the second largest city in the state, not just in terms of area but also in terms of population. Physical map and map image of Oklahoma.